1 In an experiment investigating the effect of one variable on another, the independent variable is the one that you change and the dependent variable is the one that you measure. All other variables should be controlled (kept constant). 2 The range of the independent variable is the spread from lowest to highest value. The interval is the distance between each value in the range. 3 Temperature can be kept constant or varied using a water bath. pH can be kept constant or varied using buffer solutions. 5 The precision of a measuring instrument is how consistent it is in giving exactly the same reading for the same value. independent variable, and calculate a mean. example, on a measuring cylinder marked in 2 cm3 divisions, the error in any reading will be ± 1cm3. If you are taking two readings and calculating the diff erence between them, then the error is ± 1 cm3 for each reading, making a total error of ± 2 cm3. of the table. Each value should be recorded to the same number of decimal places. This is also the case for any calculated values. 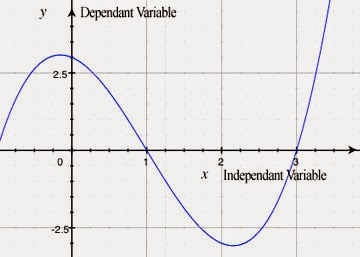 9 In a line graph, the independent variable goes on the x-axis and the dependent variable on the y-axis. Headings must include units. Scales must go up in even and sensible steps. Points should be plotted as small crosses or as encircled dots. Lines should be best fit or ruled between successive points. Do not extrapolate. 10 Bar charts are drawn when there is a discontinuous variable on the x-axis. Bars do not touch. 11 Frequency diagrams or histograms are drawn when there is a continuous variable on the x-axis. Bars touch. 13 When describing data displayed on a graph, begin by stating the general trend and then describe any points at which the gradient of the curve changes. Quote figures from the x-axis and y-axis coordinates for these points. Do not use language suggesting time (e.g. ‘faster’) if time is not shown on the x-axis or y-axis. 14 Show every small step whenever you are asked to do a calculation. in controlling variables or in making judgements. When asked to suggest improvements in an experiment, concentrate on the main sources of error and suggest ways of reducing them. tissues and no individual cells. Be prepared to go up to high power to get more information about where one tissue ends and another begins. High-power drawings should show as much detail as possible, including details of individual cells. An investigation is carried out into the effect of substrate concentration on the activity of catalase. What could be the dependent variable? 2 An investigation is carried out into the effect of temperature on the activity of lipase. Separate tubes of substrate solution and enzyme solution are left in temperature-controlled water baths for ten minutes before mixing. Why is this done? 4 For this question you need two sheets of graph paper. The light micrographs below are cross sections of a young root and a representative part of a young stem of Ranunculus (buttercup). b i On one of the sheets of graph paper, draw the outline of the root. Use at least half the width of the graph paper when making your drawing. ii Now take the second sheet of graph paper and draw the outline of the stem. It does not have to be exactly the same size as your drawing of the root. 5 A student decided to investigate the effect of temperature on the activity of enzymes in yeast. The student measured the activity of the enzymes by counting the number of bubbles of carbon dioxide which were released in three minutes. The results of the student's investigation are shown in the table. 6 A student investigated the time taken for the complete digestion of starch by amylase found in the saliva of 25 individuals of a species of mammal. A sample of saliva was collected from each individual and mixed with 5 cm3 of starch suspension. Samples of the mixture were tested for the presence of starch. The student recorded the time taken for the complete digestion of starch. The investigation was repeated with the same individuals on the following day. The results of the student's investigation are shown in the table.